To increase production from the field, it was decided to relax rate restrictions on wells in a giant oil filed. Since water was being injected in parts of the field for pressure maintenance, and since water production was becoming an issue for several wells, not all wells would be a good candidate for rate relaxation. The NOC needed to know which wells should be selected for rate relaxation	and which wells should not. To comprehensively study all possible scenarios, including quantification of uncertainties associated with the geological model, results of reservoir modeling from several million runs of the numerical reservoir model for this asset needed to be generated and then meticulously analyzed. Given the fact that the reservoir simulation model included almost one million grid blocks and that a single run would take 10 hours on 12 parallel CPUs, running the model millions of times and then thoroughly analyze the results of the millions of runs, was impractical. It was decided to develop a Surrogate Reservoir Model (SRM) for this field. SRM had to be built, validated, and then run millions of times. The results of the model runs would have to be analyzed in order to identify the wells that benefit from a rate relaxation program. A Surrogate Reservoir Model (SRM) was built for this field. Well-base SRM was identified as the appropriate SRM. Upon development, the SRM was validated,	by testing a large blind dataset (cumulative oil production and instantaneous water cut). Surrogate Reservoir Model was validated using 40% of the data, set aside as blind dataset. The Surrogate Reservoir Model (SRM) was ran millions of time under all possible	scenarios (this included uncertainty quantification using Monte Carlo Simulation for each of the runs). The results of the millions of the simulation runs were analyzed and finally, using ISI's proprietary Supervised Fuzzy Clustering Analysis, the wells in the asset were divided into clusters identifying their possible response to a rate relaxation program. At the conclusion, the 165 horizontal wells in the asset were divided five clusters. It was recommended that wells in Cluster 1 followed by wells in cluster 2 can be rate relaxed with little no impact on water cut. Wells in Cluster 3 may be candidate for rate relaxation and are to be studied further; since they may or may not benefit from rate relaxation (other factors may impact their response). Wells in Cluster 4 and finally wells in Cluster 5 will NOT benefit from rate relaxation and have the potential to produce large volumes of water in case of rate relaxation. Wells in the asset were divided into five clusters. Wells in Clusters 1 & 2 were recommended for rate relaxation. Upon completion of the study in early 2005 rates were relaxed on 20 wells. The 20 wells were distributed among the five clusters to test the validity of Surrogate Model's findings. Two and a half years of field data demonstrated that all the predictions of the SRM were correct. This is a cluster 5 well. SRM had recommended this well not be subject to rate relaxation. This is a cluster 1 well. SRM had recommended that rate on this well be relaxed. 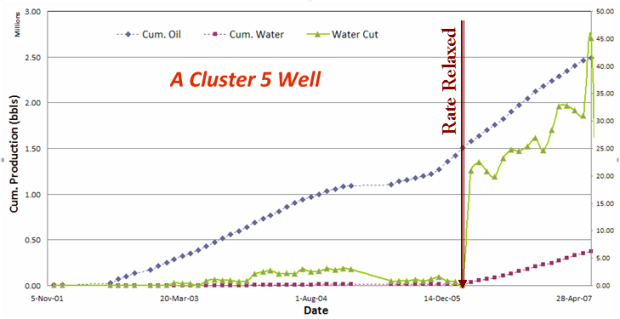 Average, per well Oil and Water production for wells in each cluster. 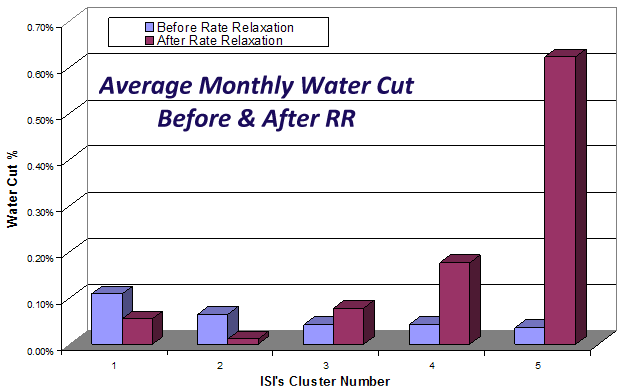 Average Monthly Water Cut Before and After Rate Relaxation for wells in each of the clusters.